When Real Simple Magazine reporter contacted me for a story on emergency rooms, I was delighted to help out. I think it’s important for readers to have the perspective from a nurse on the front line of the ER as well as ER doctors. 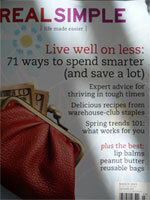 The March edition of Real Simple is on newsstands now and the article, “In an Emergency,” offers useful suggestions. (As I write this post, the article isn’t posted on the realsimple.com site). Emergency rooms can be so frightening and overwhelming, but being prepared is your first step taking charge of your health in the ER. Always carry a list of your medications with you including your medical history. The emergency room can be scary and answering the simplest questions can be difficult. Having everything written down makes it easy for the doctors and nurses to get an accurate health history. You’ll still need to answer questions by the staff, but by having your updated medication list and medical history list with you can be a life saver. Where can you find a medical history form? There are some sites where you can create a small information card; however some people are on many medications that the small size isn’t sufficient. For a 6×4 size that you can simply carry in a photo wallet, I’ve created one for you. You can download it by clicking this link. Simply print, complete and carry. Ladies, this form will fit nicely into the popular 6×4 photo wallets. Keep a list for you, your kids and spouse or significant other, parents and grandparents. It’s great for college students as well. Men, simply fold to carry in your small wallet. Consent to Treat Form can be found at Emergencycareforyou.org. In case of an emergency, having a notarized consent-to-treat form signed by the child’s caregiver will prevent treatment from being delayed. Of course any life-threatening illnesses or injuries are always top priority, but for a non-critical case having the proper forms will help expedite the process. Find the consent-to-treat form at Emergencycareforyou.org, the American College of Emergency Physicians (ACEP) website. Who will make medical decisions for you, if you can’t? An advance directive will allow a designated person to make medical decisions for you in case you are unable to. To print out an advance directive form, go to the American Academy of Family Physicians. How to be an advocate. It’s always best to have someone with you, a family member or trusted friend. By having someone at your side who can speak up, medical errors can be avoided. Even if you’re able to make your own health care decisions having a loved one with you will help ease the chaos and confusion. The ER can be extremely loud and noisy and it’s easy to get distracted. To be an advocate or to be your own advocate, remember these simple dos and don’ts. I think this was a great and informative article. I have advised my parents to do the medication list as they are on many medications and if they ended up in the ER might not be able to remember everything. What a great idea!! Plus all the other tips an remaining calm, etc are good to know. Great article. Thanks for the info. I have also prepared my parents for this kind of emergency situation. BTW, if anyone needs to fill out a “Advanced Directive Form ”, I found a blank fillable form here:http://pdf.ac/6LBxE. This site PDFfiller also has some tutorials on how to fill it out and a few related legal documents that you might find useful. « Welcome to the New Healthin30.com!